With saddened hearts we pay final tribute to a precious brother in Christ and a true man of God. One of God’s faithful warriors who fought the good fight of faith, loved God, and preached the Gospel fervently without fear or favor. His labors in the ministry and the influence of his life follow after him. Brother Wayne P. Hafley was born August 11, 1937, to the late Charles B. and Minnie Bell (Millsap) Hafley in Athens, Tennessee. He became acquainted with a young lady named Doris Jean McGahhey nearly fifty years ago. On April 15, 1956, Brother Wayne and Sister Jean were married in Athens, Tennessee. The Hafley’s home was blessed with four children. One daughter, Janice (Mike) Davis, and three sons: Daniel (Paula) Hafley, Donald (Sharon) Hafley, and Richard Hafley. December 16, 2004, God in His infinite wisdom saw fit to call the soul of Brother Wayne P. Hafley from this time world. Our brother has moved onto a higher, richer, and more joyous phase of the Church of God. The Apostle Paul penned the words in Philippians 1:23 (Brother Hafley would agree), "For I . . . desire to depart, and to be with Christ; which is far better." For our dear brother, life’s burdens are past, his afflicted body is now laid aside, and he is resting safely in the arms of Jesus. His labor of love for God, the church, and the souls of mankind is finished. He presently enjoys those things that are yet awaiting all who will be faithful. For several months Brother Hafley suffered much in his body as a result of a serious heart attack. This condition had a great effect on his physical health and strength. When he preached a message, he had to use a chair to help support himself. This was certainly not like Brother Hafley, for he was a very active preacher. Our brother was a Holy Ghost anointed, hellfire-and- brimstone preacher who told it just like it is. Brother Hafley lived an ungodly life (as most men and women do) before he met the Christ of Calvary. One evening as he attended an old-fashioned prayer meeting in Morristown, Tennessee, God began to convict him of his sin, whereupon he repented and God saved him. After a few years of living for the Lord, God began to work with him regarding a call to the ministry. As God spoke to his heart, he listened and obeyed the call. He followed as the Lord directed. 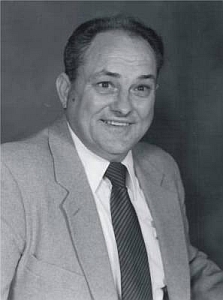 In 1964 Brother Hafley began his first work as the pastor of the New Hope Church of God in Murphy, North Carolina. This is where Brother James Lovingood pastors at this present time. He then went to pastor the New Bethel Church of God in Madisonville, Tennessee, where Brother David Watson now pastors. The McMinn County Church of God was started in a building behind Brother and Sister Hafley’s home. His next congregation to pastor was the Church of God in Carrollton, Ohio. Brother and Sister Hafley started the congregation at the Mount Zion Church of God in Minerva, Ohio, where Brother Hafley finished his work for the Lord. The passing of our dear brother certainly leaves a void in his home with his dear wife, his family, and the congregation he pastored for the past twelve years. Truly the loss of our brother is great, but God is able to carry on the work. When Moses was called from this time world, God called Joshua and said, "Arise, go." We say to the dear saints at Mount Zion Church of God, Be encouraged and hold fast to God’s never changing hand, for He has promised to see you through every trial and hard place. The hour may seem dark now, but remember this: it is always darkest just before the sun shines. David penned the words in Psalm 30:5, ". . . weeping may endure for a night, but joy cometh in the morning." It is so important that you stand steadfast in faith, lean heavily on God’s Word and look to and wait for His direction. Our prayer is that God will grant the grace, the strength, and the comfort that are so greatly needed at this time of bereavement. Adobe Reader is required to view messages online. Feel free to print these articles for your own use. All we ask is that you be considerate of the author and not publish their works online or in another publication, sell, or mass distribute them without written permission. If permission is granted,please acknowledge the author and provide a direct link to the page from which it was obtained. This site is dedicated to the glory of God and maintained by . . .
© 2002 - 2016 Church of God, Inc. All Rights Reserved. Do not reprint or distribute without express written permission.